You can prevent silverfish from infesting your home, and environment by hiring the best silverfish control service near you. However, you can fix other things to stop this nuisance from invading your beautiful home such as: eliminating sources of excessive moisture in areas like plumbing, and regions of condensation because silverfish thrives in a moist environment. Furthermore, a dehumidifier can come in handy when reducing moisture content in the air thereby making the environment for silverfish to survive. You can improvise if you do not have a dehumidifier; run an air conditioner, remove standing water from premises, ventilate closed rooms and attics, get a bathroom fan in the shower area. Also, you can reduce clutter and food source; the basic necessity for all living things including pesky pests are food, water, and shelter. If you can eliminate all these from your home, silverfish will have no option but to leave your “unsuitable” home. Vacuum cracks and crevices regularly, store pantry food such as flour, cereals, and pet foods in airtight containers to reduce food sources. Silverfish eat a wide variety of foods that contain carbohydrates and protein. They feast on dried beef, starch, flour, dead insects, cotton, paper, glue, linen, and some synthetic fibers. Also, ensure that vents are open in the crawlspace; they feed on surface molds found on found on cardboard boxes that are kept in damp attics or basements. Silverfish living outside your house may pitch their tents under rocks, stones, leaf clutters or birds’ nests. They love warm temperature so remove any possible harborage areas such as grass and leaf litter close to your home. Clean your gutters, and use standard exclusion techniques like caulking the cracks and crevices. Also, make sure the screens are tight fitting and use weather stripping around doors and windows. Silverfish are about a half-inch long, it has a long and slender body, and it has a uniform silvery color over the top surface. Also, silverfish are broad at their head with a gradual tapering toward their rear. Furthermore, they prefer damp environments with moderate temperatures such as laundry rooms, attics, and under sinks. Silverfish are capable of traveling long distances looking for food. It makes it difficult to identify the source of silverfish infestation. Moreover, they prefer a dark and moist environment with 75% – 97% of humidity. Some of their favorite environments are behind baseboards, kitchen, bookcases, closet shelves, sinks, wall voids, subfloors and attics. Cast skin: silverfish molt all through their lives, so finding cast skins is one of the best indicators that you have silverfish infestation in your home. Small irregular shaped holes in fabrics: silverfish love to eat glue, it is normal to see irregularly shaped holes in wallpapers as well as fabrics. Yellowish stain on fabric: they are fond of damaging the fabrics, but lightly. 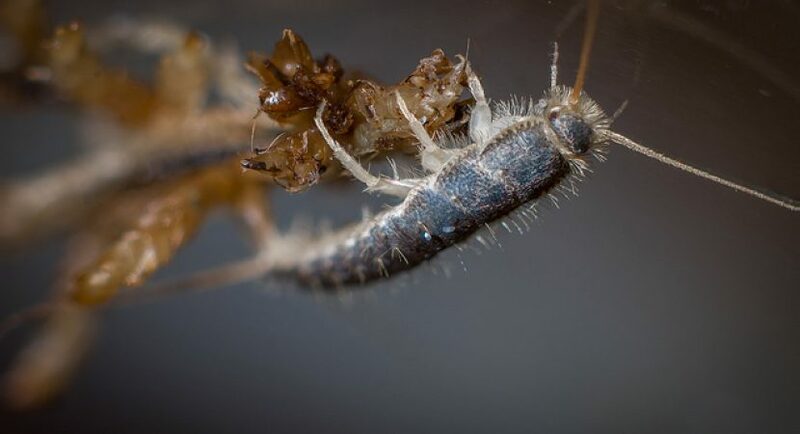 To avoid these pesky insects from destroying your valuables, it is necessary to get a professional pest control operator to inspect your home for any pests such as silverfish.